Posted by Jon in Funko, Review, Video Games with 0 comments. Dr. Wily, cool! Mega Man, expected. Thunder Beam Mega Man, oh no. Leaf Shield Mega Man, sigh. Chase. Atomic. Fire. Mega. Man. Really Funko? Your best was Wily and three Mega Man palette swaps? Well, I suppose it wouldn’t be a Mega Man toy line without the disappointment of no Robot Masters. Despite my disappointment over the character selection, I did run into these during a routine GameStop run and figured at ten bucks each, why not? Dr. Wily was an instant buy. However, even with the chase figure missing, I wasn’t about to purchase three additional Mega Men. I narrowed it down to the one that I found most appealing: Leaf Shield Mega Man. So what is this line, exactly? The figures are between 4.5 to 5 inches in height. I don’t have any of Jakks World of Nintendo action figures handy, but this series appears to scale pretty well with those. I count about 12 points of articulation on Mega Man, and he also includes optional hand parts. 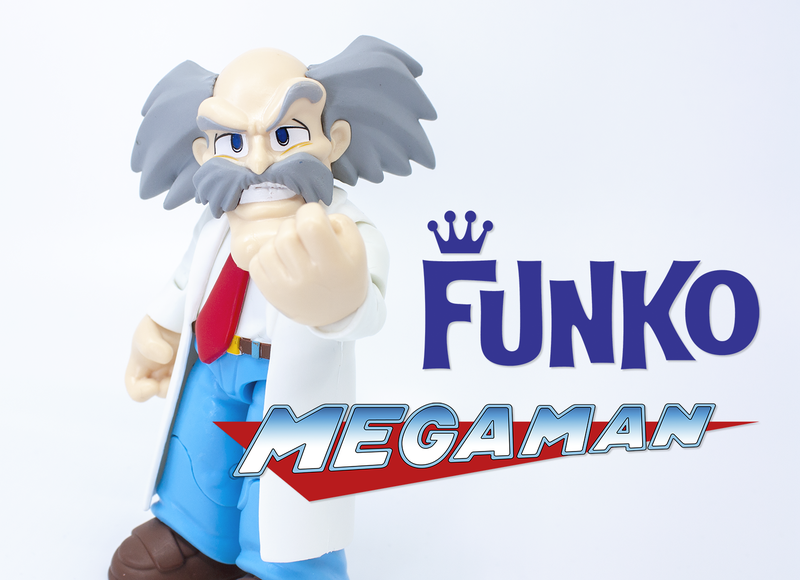 Dr. Wily looks to have 11 joints but does not include any accessories. I suppose I’m more forgiving with Wily since he doesn’t have three variants to offset his tooling cost. The first thing you probably want to do with both of these figures fresh out of the box is run them under some hot water to loosen up their joints. Both Mega Man and Dr. Wily’s joints were super tight at first, to the point that I felt like I was going to snap them if I pushed any harder. So I put the duo under hot water for a few minutes and then worked each and every joint. The plastic softened up a bit and now everything moves as it’s supposed to. Overall the paint is okay. There is a small amount of visible slop and parts missed. But overall it isn’t too egregious. They caked over my Wily’s teeth with white paint, which appears to cover up the contours of the teeth. As far as articulation use is concerned, both figures’ hips are generally useless. Mega Man’s have a small circle of range. Wily has a little more but it is also hindered by his lab coat. The shoulder balls and elbow-hinges are pretty good all around. The ball-jointed neck on Mega Man works really well and has great range, but the giant chin on Wily limits his neck quite a bit. Also, no articulated eyebrows? Would I suggest Funko’s Mega Man Action Figures? These are fun little toys for what they are. There are plenty of better quality figures at higher prices, especially from the import market. However, if you want a $10 Mega Man or Wily to go with your World of Nintendo or other video game display, I think this will likely suit your needs. I guess the real question here is if this will become a series of toys with multiple waves? Honestly, I kind of doubt it. Funko is a well-oiled nostalgia machine that just dumps out stuff and moves on. My gut feeling is that unless Mega Man ends up being some kind of mega-hit, this will be all that we get. I would probably buy into this line with the mindset that this will be one and done, so that way you aren’t regretful when nothing else comes about. If something does, hell, then it’s a bonus! Amazon currently had these figures up for preorder with the release date imminent. Entertainment Earth should also have these shortly, if not already.